With There Programming Language Sounding Domain Name Extensions, Domain Hack Can Be Done For Usages Like Hosting Custom Scripts or Softwares. Previously we talked about Domain Hack, which is nothing but tricky usage of words, subdomain and the Domain Name Extensions to create a meaningful word like del.icio.us, ma.tt etc. Partial domain hack is like –dr.abhishekghosh.net. Major Hayden’s MySQL Tuner uses such a domain name – mysqltuner.pl. The domain mysqltuner.pl actually point towards https://raw.githubusercontent.com/major/MySQLTuner-perl/master/mysqltuner.pl – a perl script. Perl’s extension is .pl, together it actually making the script memorable to use from SSH. Although there is no country which has extensions of commonly used languages or markup languages like html or php or css, there are quite good number of programming language sounding Domain Name Extensions which can be used for hosting or doing 301/302 redirection towards a script or program. Readers contribution will be helpful to us and the other readers. Shebang Script itself a funny name and it also has corresponding domain name extension – .sh. SH is the official abbreviation for the German federal state of Schleswig-Holstein and the .sh domain is used for some quasi-governmental sites. DeviantArt uses stash with the .sh extension – sta.sh. Do not expect bash – ba.sh actually a parked website for sell. We use Markdown to write stuffs like README.md, actually there is a domain name extension .md, it is .md is the a ccTLD for Moldova. README.md is not registered, basically it is for MDs. You can not expect markdown.md to remain to make few million dollars. In the same way, .do is ccTLD for the Dominican Republic which can be used for Java Servlet file. One of the commonly used language, beloved Python actually has .py domain extension. There is official website with sarcastic combination – http://www.nic.py/index.php ! Actually .com.py is allowed but it costs f//k/ng $350 per annum total fee plus VAT. .py is ccTLD for Paraguay. .rb domain was Ruby’s April Fool, .js actually has some progress to become a domain. .cc is actually meaningful (in our on-topic matter), .cc is top-level domain for Cocos Islands. This Article Has Been Shared 4282 Times! Unified Communications describes the integration of communications media in a single application environment through combination of all communication services. 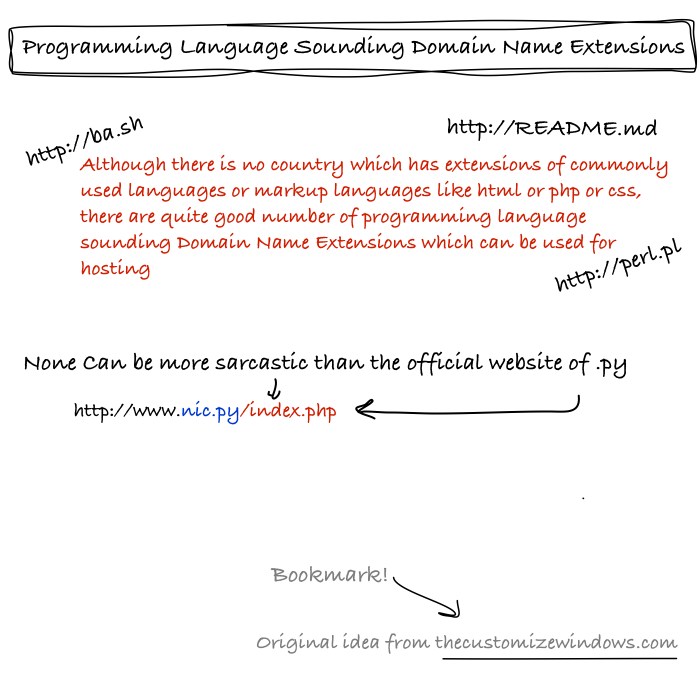 Cite this article as: Abhishek Ghosh, "Programming Language Sounding Domain Name Extensions," in The Customize Windows, June 29, 2015, April 25, 2019, https://thecustomizewindows.com/2015/06/programming-language-sounding-domain-name-extensions/.